Our Prophet Muhammad ﷺ said: “Verily you shall conquer Constantinople. What a wonderful leader its leader shall be, and what a wonderful army that army will be!” (Musnad Ahmad). 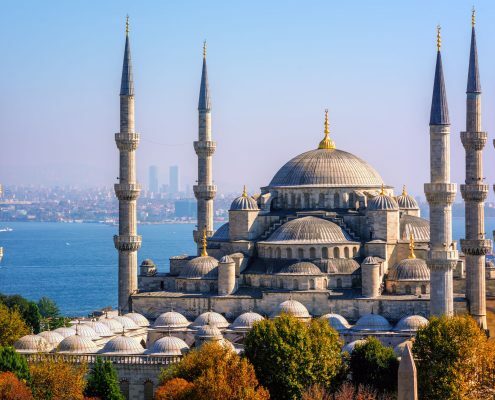 The Süleymaniye Mosque – Though not the largest of the ottoman mosques, the Süleymaniye mosque is certainly one of the grandest and most beautiful landmarks, dominating the city of Istanbul. The mosque and its surrounding buildings were designed by Mimar Sinan, the most famous and talented of all imperial architects. Inside, the building is breathtaking in its size and pleasing in its simplicity. Sinan’s türbe (tomb) is just outside the mosque’s walled garden, next to a disused medrese (seminary) building. Hagia Sophia is a great architectural beauty situated in the heart of Istanbul and an important monument for both Byzantine and for Ottoman Empires. It was originally built as an Eastern Orthodox cathedral and later converted into a mosque when the city was conquered by Sultan Mehmed II in 1453 CE. It remained as a mosque until 1931 when it was turned into a museum. Conquering Istanbul was not just the dream of many statesmen, it was also an important aim for Muslims for centuries. This aim was kept alive for Muslims with the Hadith of our Prophet ﷺ stating: “One day, Istanbul would be conquered, the commander who conquered her is how pleasant commander he is and the soldier who conquered her is how pleasant soldier he is!” According to rumour, When Sultan Mehmet heard about this hadith narration, he went to the Hagia Sophia; he prayed two rak’ahs prayers as thanks to the God, and the first call to prayer was given here at that moment. After the Conquest, Conqueror Sultan Mehmet prayed again here on first Friday and then Hagia Sophia converted into the mosque as a symbol of conquest. The Topkapi Palace was the administrative and residential palace of the Ottoman Empire in Istanbul which was completed by AH 882 / AD 1478 after the city had been conquered by Mehmed II. It was used continuously by the Ottoman rulers until they moved to the palaces built along the Bosphorus as the palace became a museum in April 1924. The museum covers approximately 400.000 square meters and is divided from the land-side by the Imperial Walls and the sea-side by the Byzantine Walls. Most importantly, the holy relics of our Prophet ﷺ and the first caliphs were brought from Medina in the early 10th/16th century by Selim I, which are exhibited in the Holy Relics section. Eyup Sultan Mosque/Tomb of Hazrat Abu Ayyub Ansari () is located on the outskirts of Istanbul. When the Prophet (peace and blessings of Allah be on him) emigrated to Madinah, all of the Ansar were keen to host the Prophet (peace and blessings of Allah be on him) in their house. The Prophet (peace and blessings of Allah be on him) made the decision that he would stay where his camel stopped and it subsequently stopped at the residence of Abu Ayyub Ansari. The Prophet (peace and blessings of Allah be on him) stayed at his house for 7 months.